Click map to enlarge. The current Tramlink network including the new route 4 which at present runs between Elmers End and Therapia Lane. Tramlink – forever unique in London? We are going to stick our neck out a little and suggest that Tramlink will be the only tram network we will see again in London, even though a few years past it appeared that there would be a brief tram renaissance. Many schemes were proposed, with two showing particular promise. These were an ambitious scheme in West London and the even more ambitious Cross River Transit, that would run through central London. Unfortunately the West London Tram scheme incurred a lot of opposition. To make matters worse, that resistance was from highly organised professional people undaunted by the prospect of taking on the legal challenge of opposing the scheme. Because it was primarily an on-street scheme it did have a lot of disadvantages that the objectors could exploit. Initially it survived because it was based in a Borough where the Labour majority was in favour of the idea. Their majority was small, however, and so it was no surprise when the scheme was abandoned once the local Conservatives were in control. The lesson learnt was a harsh one. Cross London Transit (CRT) had all-party support, although some influential Conservatives were vehemently against it. Like West London Tram, the reason given for abandonment was because the money was not available, but it could be argued that the time for on-street trams had by then come and gone. The capacity of CRT trams would not have been as much as those of Croydon – they would have had 2 + 1 seating unlike Croydon’s wide trams. Such trams in capacity terms are merely oversized buses rather than undersized trains. The narrower trams meant that in places buses could not share the infrastructure so the potential delay to buses had to be factored in. The cost of providing on-street trams showed no sign of coming down as expected and the cost of moving utilities continued to mount. Furthermore there was a gradual realisation that trams were not going to have the ability to solve major capacity problems, and that if growth continued as it seemed likely to do then we had to stop thinking about trams and think again seriously about new underground rail lines. A short but critical part of the Tramlink network. This photos is taken from the platform at Sandilands and is looking west towards Croydon. The strip of land occupied by the tram tracks was originally safeguarded for a road widening scheme that never happened. The road in question is a red route, the A232. Note the queue of cars waiting to cross the junction having been delayed by the trams. As the above hopefully shows, Croydon was lucky. 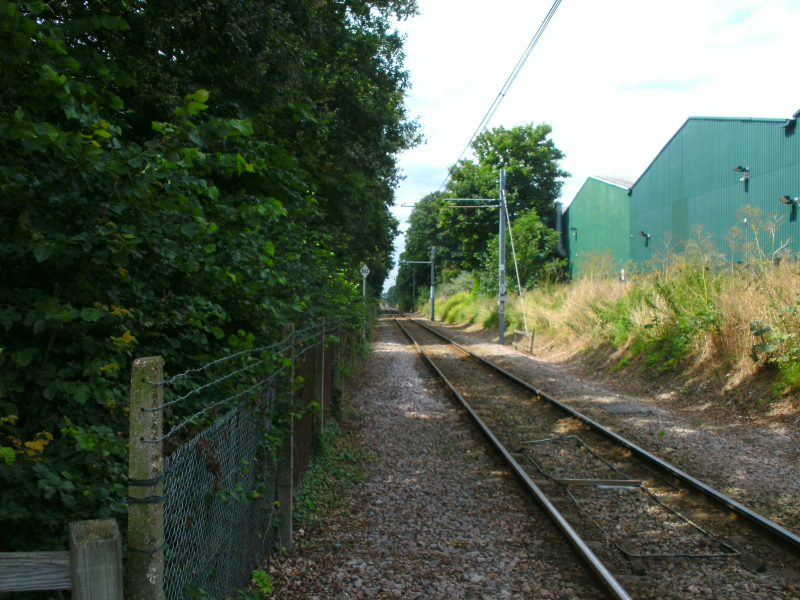 A disused rail alignment, two further railway lines in use but ripe for conversion and a short but critical strip of land safeguarded for a subsequently abandoned road scheme meant that on-street running would be minimal. Furthermore suitable new road and traffic management schemes could divert traffic away from nearly all the stretches that were to be shared with other traffic. It is unlikely such an opportunity will present itself again. Readers, especially those in North London, may point to proposals for some kind of Light Rapid Transit based around Brent Cross. TfL have never shown enthusiasm for this, however, and have even gone as far as stating that if the Dudding Hill Line were to have passenger services restored they would rather it was by a London Overground service. The history of Tramlink is a long one but we will restrict ourselves to that which is relevant to the current day. Tramlink was approved by the government in the 1990s. One last minute hitch was a the withdrawal of £10 million of the necessary funding by the Treasury at short notice. Croydon Council was able to fund some of the necessary highway changes, and some savings were made by selecting less aesthetically desirable options, terminating at New Addington slightly short of the originally proposed location and replacing a proposed short tunnel under a main road with a crossing at ground level. One crucial cutback was a section of double track between Beddington Lane and the tram-over-rail bridge at Mitcham Junction. Looking towards Mitcham Junction from a point just west of Beddington Lane stop. In the original Tramlink plans this would have been double track. Tramlink was to be run as a Concession with a DBOM (Design, Build, Operate and Maintain) contract. This seemed a good idea at the time but the flaw in this arrangement soon became apparent. Due to unexpected difficulties, mainly involving electrical earthing issues, Tramlink opened late and with no money coming in for a while its ability to show the projected healthy profit was deeply tarnished. The rational approach, given the commercial nature of the company, was to run the contracted service but otherwise keep a tight rein on expenditure and minimise any risk. This became apparent when the company was not prepared to improve on the contracted sparse evening service without a direct subsidy. The situation reached near farcical proportions when a new stop at Centrale in central Croydon was built with developer money at TfL’s insistence. The stop was built at great cost but the company that had the tram concession decided not to use the stop. Their argument was that it would primarily divert existing custom rather than attract new passengers, so there was no benefit to them. At one point they were demanding an extra tram to be provided to enable them to continue to run the contracted service without increased risk of failing to meet their performance targets which would encounter a penalty. TfL on the other hand were in no mood to make any concessions whatsoever. Centrale Tram Stop in central Croydon eventually opened in December 2005. It had been completed months earlier but a dispute between TfL and TCL meant trams passed without stopping. The following is, of necessity, a simplified guide to traffic flows on Tramlink. As a very crude rule of thumb outward journeys tend to be from home to a major station, shops or central Croydon and vice versa for return. The relevant stations that are major destinations are Wimbledon, East and West Croydon, Elmers End and Beckenham Junction. Birkbeck is one of the quietest National Rail stations in London and modal transfer here would either be minimal or non-existent. Mitcham Junction may see some inter-modal transfer but not on the same scale as the others. The morning peak primarily consists of journeys to the major heavy rail destinations and the central Croydon stops. After the morning peak Ampere Way (for Valley Park shops – IKEA etc.) and to a lesser extent Waddon Marsh (Purley Way superstores) also become major destinations. During planning it was presumed that the New Addington Branch would be the busiest and that the Wimbledon branch would be relatively quiet. This assumption was largely based on the fact that the former Wimbledon–West Croydon rail shuttle ran every 45 minutes, and consisted of two carriages which weren’t exactly overtaxed by the demand. When a Rail Replacement Bus Service ran during conversion of the branch a bus would typically have one or two people on it. Indeed at the time some questioned why a minibus or even a taxi was not used instead. It thus came as a complete surprise when Tramlink opened, and the Wimbledon branch was so busy that its 6 trams per hour (tph) soon proved to be inadequate. In retrospect we should not be so surprised, as the importance of a turn up and go service is now well recognised. Other reasons such as extra stops, a service to the heart of Croydon, relative cheapness and the perception that as it was new, it must be good, also played a part. 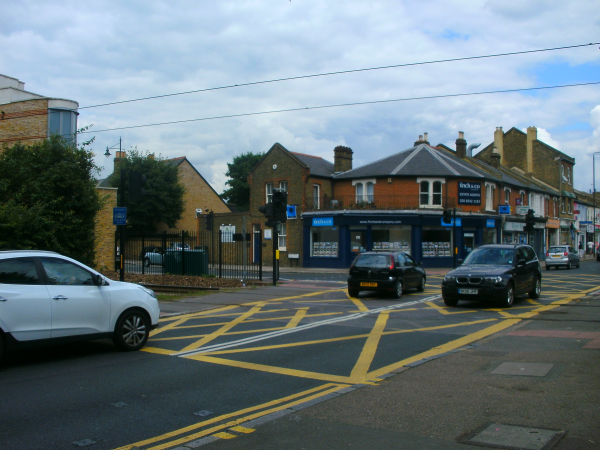 Merton Park Road Crossing. This is where the Wimbledon branch crosses the busy A238, the Kingston Road. Initially a service of 6 trams per hour (tph) in each direction used this crossing. It is now 8 tph and this could rise in future. To make matters worse the location is also a T road junction. In contrast to the Wimbledon branch, passenger usage on the New Addington branch was slightly below expectations. This was a bit disappointing as one of the prime justifications for Tramlink was to provide the New Addington Estate, at the time of building reputedly the largest council estate in Europe, with a decent public transport service that was not 100% reliant on buses. The New Addington branch originally had 9 tph which was subsequently regarded as marginally greater than needed. Originally Wimbledon trams ran to Elmers End every 10 minutes. It became the objective, however, to improve the busy Wimbledon branch and run 8tph along it. This was regarded as the maximum frequency that could be achieved with the existing infrastructure. The obvious expedient thing to do was to restructure the service and run a 8 tph Wimbledon-New Addington service, and this was thus done from July 2006. 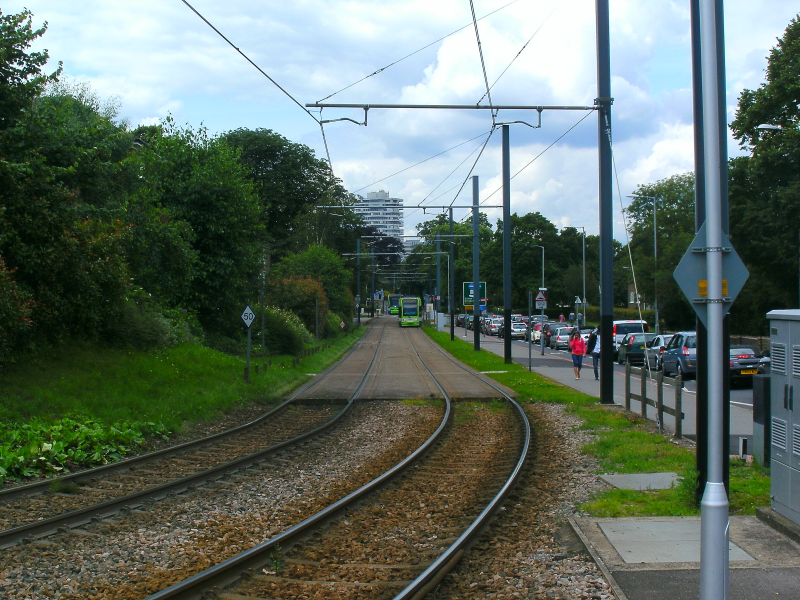 The remaining lines were covered by an Elmers End-Croydon Loop-Beckenham Junction service, which for passenger clarity was advertised as two separate lines. Line 1 was Elmers End to Croydon and Line 2 was Beckenham Junction to Croydon. Originally Lines 1 and 2 had a 10 minute service (6 tph) but it proved difficult to have sufficient trams in service and it was later reduced to a 12 minute service (5 tph) after the morning peak period. One benefit of the revised pattern was the new ability to go directly from New Addington to places like IKEA served by Ampere Way. This improved service for shoppers was no doubt anticipated. What was not fully appreciated in Tramlink’s early days though was the number employment opportunities that had been taken up in the Valley Park retail outlets by residents of New Addington. Prior to the tram coming, such a commute would have been impractical or at least very difficult. 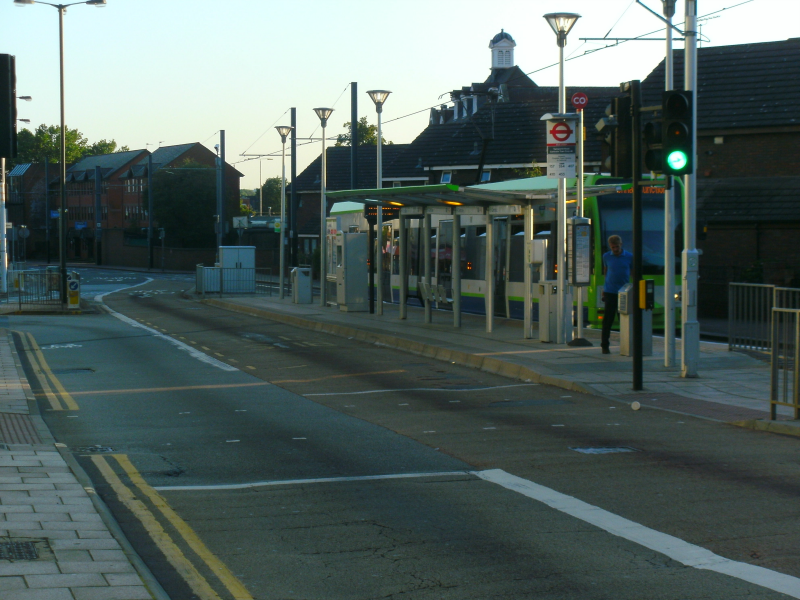 Tramlink’s direct service, therefore, proved to have a major social benefit. A clear reminder that it is sometimes important to look at transport schemes from more than just a transport perspective. As time progressed the downside of the PFI contract really started to show. 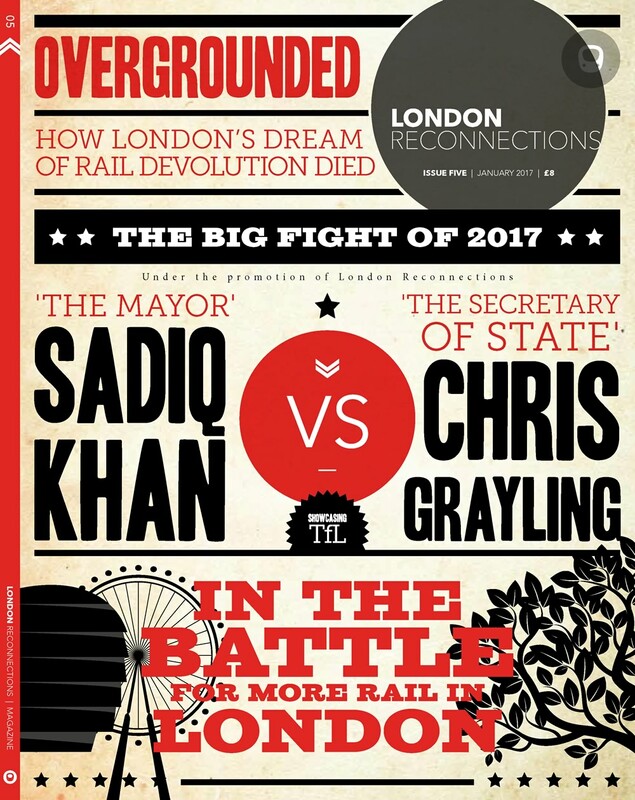 Beyond the day-to-day conflicts, two disputes arose which involved serious sums of money, and on at least two occasions the concessionaire, Tramlink Croydon Ltd, took TfL to court. TCL alleged that TfL had broken an agreement, express or implied, to recast bus services to feed in to Tramlink. Furthermore they were actually running routes that competed with Tramlink contrary to what was intended. TCL lost the case. TCL alleged that they were entitled to charge a premium fare above the standard fare for a bus journey. Indeed this was initially the case but TfL chose to simplify the fare structure and charge the same price for trams as for buses. TCL won this case, but instead of a fares hike TfL compensated TCL for the loss of income. The latter case cost TfL around £4 million in the first year in payments to TCL. Of course TfL could to some extent offset that against the need to contract fewer buses to provide the necessary service. It could also be argued that, so long as there was unused capacity on the trams making the marginal cost negligible, this solution would appear to be the best use of resources overall. Nevertheless this was an ongoing cost that TfL would rather not have had. As the relationship between TCL and TfL continued to deteriorate, the ultimate outcome became somewhat inevitable. The investors behind TCL had already written off their capital outlay and a tram system with no realistic prospect for growth is not the sort of investment that a Venture Company like 3i wants on its portfolio. Furthermore it was clear that the concessionaire would always be a hostage to TfL policy decisions over which they had very little control. Any hopes of benefiting from their experience and being in a good position to bid for other tram schemes in the country was also rapidly becoming a non-starter. TfL, on the other hand, must have been equally frustrated. Flushed with the success of London Overground, they were keen to see Tramlink prosper and grow in the same way. Options to improve things which should have been easy to implement – such as a decent evening service, a spruce up of the stops or a refurbishment of the trams were unachievable. It was pointless making grandiose plans for the future with no control over either the finance or the implementation. What is more, the £4 million compensation payment mentioned above was an annual charge and only likely to increase as time went on. It therefore came as no surprise when it was finally announced that TfL had bought out TCL for £98 million. TfL justified the expense at the time by emphasising that they would no longer need to budget over £4 million per year to pay TCL. Effectively they were investing their money at around 4% interest. Even if they had to borrow the money it represented a solid investment, as TfL can borrow money at extremely advantageous rates. One suspects that the owners of TCL were just as pleased with the deal in the end. In June 2008 TfL became the outright owners of Tramlink. They moved quickly to gains some “quick wins” with a new colour scheme and tram refurbishment as well as some improvements to stops. Overdue track replacement was also carried out. By now the number of annual journeys exceeded 28 million, however, on a system only designed for 24 million. Regardless of what improvements were finally decided upon, more trams were clearly needed. Unfortunately an order for a small batch of new trams was always going to be very expensive, so TfL asked for expressions of interest to supply up to ten trams, probably secondhand, to supplement the existing fleet. Once they could establish how many trams they could get hold of they could then make appropriate improvements to the infrastructure to use them to best advantage. As it turned out, TfL hit something of a jackpot. As we have previously reported, by an enormous stroke of luck TfL were offered six suitable new trams at very competitive prices, and so the idea of procuring some secondhand trams was quickly abandoned. In part 2 we will look at the work done to accommodate these trams, and the revised service that has been provided as a result. We’ll also look at the network today critically and identify its good and bad points. Finally, we look towards the short term future and what services we may expect in the next year and beyond.